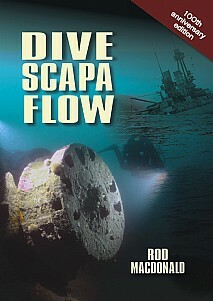 Dive Scapa Flow has been THE definitive guide to diving the fabled wrecks of Scapa Flow, one of the world’s greatest wreck diving locations. This completely re-written and updated centenary edition is produced to coincide with the 100th anniversary of the scuttle of the 74 warships of the interned German High Seas Fleet at Scapa Flow on 21st June 1919 – the greatest act of maritime suicide the world has ever seen. The dark depths of Scapa Flow conceal the remains of several of the Kaiser’s WWI High Seas Fleet. Three massive 575 feet long 26,000-ton König-class battleships await exploration – huge underwater mountains where divers can see the last 12-inch big guns to have fired at British warships at the Battle of Jutland in 1916; or drift along rows of 5.9-inch secondary battery casemate guns and see massive masts and heavily armoured spotting tops. Four 5,000-ton, 500 foot long, kleiner kreuzers, Brummer, Cöln, Dresden and Karlsruhe lie on their beam ends open for inspection with parts that remained on the seabed of many other High Seas Fleet vessels as they themselves were lifted to the surface during the greatest feat of underwater salvage that has ever taken place. Add in a U-boat, a boom defence vessel, an Icelandic trawler, a number of drifters, WWII vessels, many ‘blockships’ intentionally sunk to block the smaller channels into Scapa Flow during WWI and WWII and it becomes apparent what Scapa Flow offers divers. Scapa Flow’s war graves, HMS Royal Oak, torpedoed at the beginning of WWII and HMS Vanguard, which blew up in a catastrophic magazine explosion in 1917 and HMS Hampshire, which struck a German mine and sunk on 5th June 1916 north-west of Orkney carrying Lord Kitchener and his staff on a secret diplomatic mission to Russia, are off limits to divers today – but their stories are recounted to preserve the memory of those that perished. This indispensable guide is a must for any diver interested in shipwrecks and will also appeal to all those with an interest in maritime and naval history.